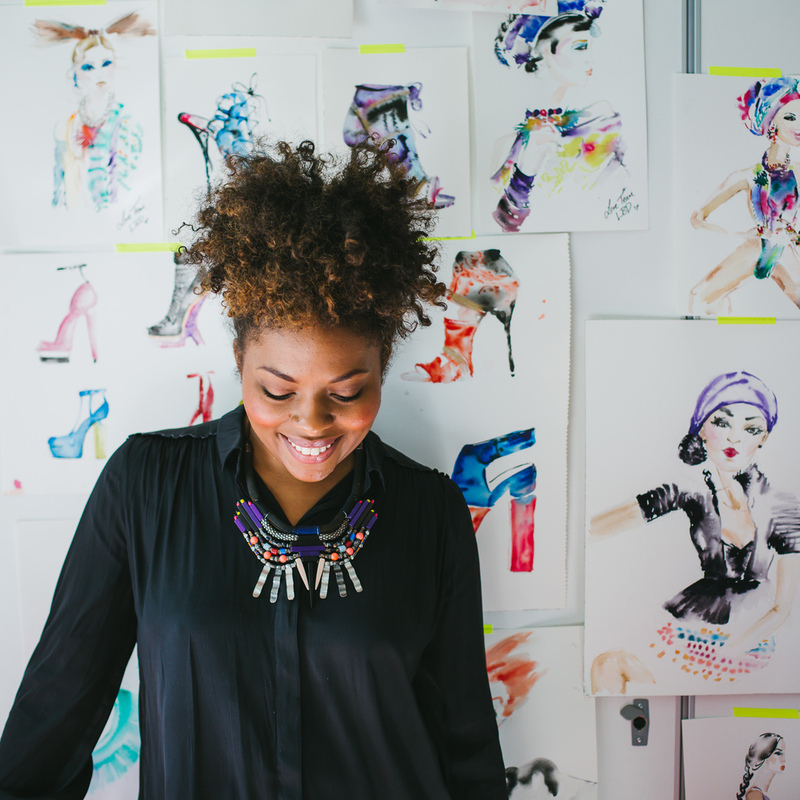 I'm Kris Keys, an American fashion illustrator and print designer living in London. I specialize in watercolor and ink paintings. I've been drawing my whole life. My aunt studied fashion design in the early 90's, and I started mimicking her figure drawings and watching her draw. That's when it began, but I started illustrating professionally in 2012. Yes. I mostly freelance by creating illustrations or prints for other brands. Other than that, I teach fashion illustration classes online, sell prints from my original work, and perform live illustrations. There are so many museums, galleries, people, food, and culture to gain inspiration from in London. I also like that other inspiring countries and cities are very close and easy to visit. Trying to juggle everything and learning more about the marketing side of this business has been a challenge, but it's getting better. I'm learning a lot by connecting with other creatives and entrepreneurs through platforms like Periscope. I start with research most of the time. I gather pictures or ideas by creating mood boards and start sketching from there. WHAT ADVICE WOULD YOU GIVE SOMEONE ASPIRING TO DO WHAT YOU DO? I'm always inspired by hearing the stories of women across the world. I read a lot of biographies and listen to the stories of successful women as I'm illustrating live. That always gets me pumped to keep creating and also sharing my own story with others. The vibrancy of the colors in my work along with the softness of the movements makes my work unique. I also think that the places that I've lived have had an influence on my work. I got the majority of my art education in my hometown Memphis, which is a very gritty city. Most of my early paintings had a lot of color and were heavily influenced by Memphis music. Then, I lived in New York, which has a lot of energy and I loved to people watch. I was very inspired by grind and always being on the go. Finally, London allowed me to slow down, think and really perfect my style. I took my sketchpad to a lot of exhibitions of artists and designers I admire like Leonardo Da Vinci, Alexander McQueen, Yohji Yamamoto, and Louise Bourgeois to name a few. I also had more time to perfect my style and sketch live during fashion shows. I contribute the soft fluidness of my work to my years in London. WHAT IS THE MOST USEFUL TIP OR ADVICE YOU'VE EVER BEEN GIVEN? You know what you're passionate about. You know what your talents are, so chase after that. Everything else is a distraction. I think it's super important to focus on one idea at a time and master that to the max before moving to something else. Yes. When I'm illustrating live, the sitters see the process from start to finish so I really have no choice. I would hope that my audience finds my work inspiring and dreamy. In 2013, I began a course in Fashion Design at London College of Fashion. Since then, my practice has evolved into print designs and performance art. The briefs and industry projects that I've worked on at LCF intrigued my interest in prints and textiles. I see myself eventually illustrating in front of larger audiences and my designs being printed on home/fashion products for sure. I'm currently working on a series of paintings, where I visit cities and illustrate women live throughout the world while documenting their thoughts on beauty. In June, I'm opening the portraiture sittings to the public where women can come to have their portraits painted.